Executive Producer Eli Roth rebooted his instant classic ‘Cabin Fever‘ from 2002. It’s not a straight copy of the original because there are all new characters and all new kills! The story is so simple, but the director does so much with it. Five friends, college behind them head to a remote cabin in the woods for a final week of partying before they have to enter the responsible adult world encounter a truly horrifying and gruesome flesh-eating virus. What’s not fun about that?! It’s a horror-comedy that stars Gage Golightly(‘Teen Wolf‘) Nadine Crocker (‘Deadgirl‘), Samuel Davis (‘Machete Kills‘) and Dustin Ingram (‘Paranormal Activity 3‘). 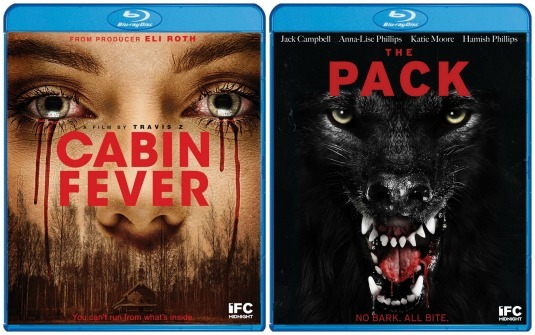 ‘The Pack‘ features the uninhabited Australian Outback, where a sheep rancher and his wife and two teenage children live in bucolic isolation. One night it all changes when a pack of rabid, bloodthirsty wild dogs surround their home. No one is around to help the family and they must work together to survive. The movie stars Anna Lise Phillips, Jack Campbell, Katie Moore and Hamish Phillips. This entry was posted on Tuesday, June 7th, 2016 at 5:42 pm	and is filed under Film, News. You can follow any responses to this entry through the RSS 2.0 feed. You can skip to the end and leave a response. Pinging is currently not allowed. « WWE’s Luke Harper Joins Cast Of Horror Flick!!! !